Matcha lovers rejoice! 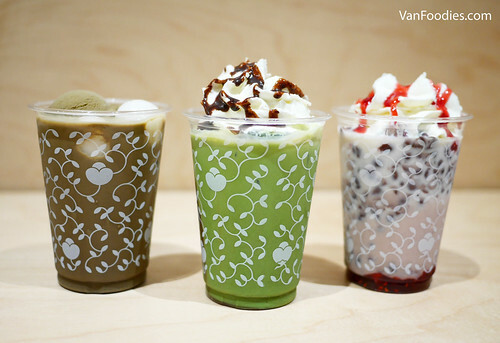 Considered the Starbucks in Japan, Nana’s Green Tea has arrived in North America. In fact, their first ever North American location will be right here in Vancouver! On June 6, their Kerrisdale location will open its door to the public. Established around 10 years ago in Japan, Nana’s Green Tea was brought to us by Kazuto Kutami. 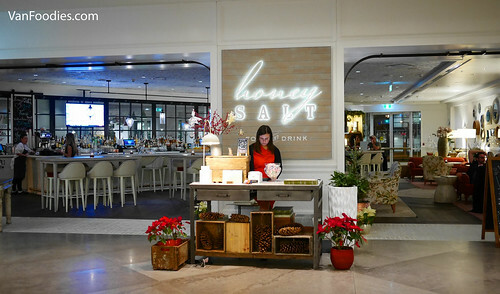 He was inspired by the Starbucks concept while wanting to preserve the history and tradition of Japanese tea culture. Their matcha is sourced solely from Uji, Kyoto. To-date, there are more 80 Nana’s locations around the globe. These are only taster size. Of the three beverages, my favourite was the Hoji-cha Shiratama Float. Shiratama in this case means sticky rice, which means there are mochi (aka sticky rice) balls in them. Hoji-cha is roasted green tea, so there’s some nutty flavour in the drink, as well as in the Hoji-cha ice cream. It’s quite unique and I don’t think I’ve seen something like this in Vancouver yet. Azuki (red bean) Strawberry Latte is on the sweeter side, but not overly sweet. There is red bean paste and small pieces of strawberry in the drink so it’s quite fun to drink. It kind of reminds me of the HK style Iced Red Bean Drink 紅豆冰. Although tasty, relatively the Matcha Chocolate Latte wasn’t super interesting. That being said, the matcha flavour was very strong, with just a hint of sweetness from the chocolate. I should note that there are many other options for beverages on the menu. There are 12 matcha options, 5 for hoji-cha, 5 azuki, and 5 options for just green tea. The only savoury dish we tried. This donburi was very good. Tuna was flavourful; the curry tartar (think curry mayo egg salad) was fragrant with a hint of spices. 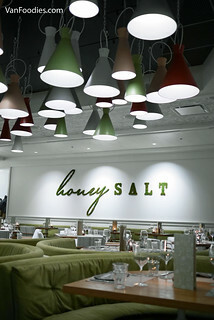 To celebrate my parents’ wedding anniversary, we went to Honey Salt at the Parq Vancouver for dinner. Since its opening, I’ve been seeing photos on Instagram and I’ve been curious about it. Finally our turn to check it out. So it’s our first time at the restaurant AND the casino. Everything looks shiny new to us. The restaurant interior is quite cute. It reminded me of a modern cottage kitchen/nook, with cupboards and shelves, hanging lights, and a lot of white and green. I quite like the style. The four of us shared a few appetizers. First, the Tofino Fry. 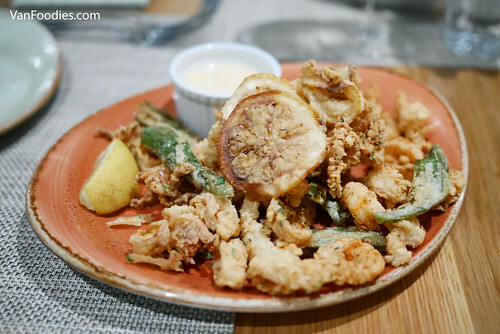 Fried calamari and side stripe shrimps on one plate. The batter was thin, outside was crunchy, and the meat was tender. The Japanese mayo dipping sauce had some subtle heat; in my opinion the heat could be dialed up a bit. What surprised me was the few slices of fried lemon. Perhaps the batter took away some of the acidity, so it wasn’t face-puckering sour. The citrus flavour worked well with the seafood. The Crisped Bacon Brussels is listed under Sides, and it’s in small print, so make sure you don’t miss it. I was quite excited when Mon Paris opened up in Burnaby. I was following them on Instagram and the cakes were just beautiful! I also love that it’s near the Metrotown Skytrain station, which means easy access from Coquitlam or downtown. I took my mom there, who also loves some good pastries. We had the Passionata (left), Opera (right), and a Canele (back in the pic) over Espresso and Americano. I really liked the tartness of passion fruit and mango pieces in the Passionata; the Canele had a crispy, caramelized exterior and soft centre; and the Opera was rich and decadent. We were there for an afternoon pick-me-up and it just hit the spot! 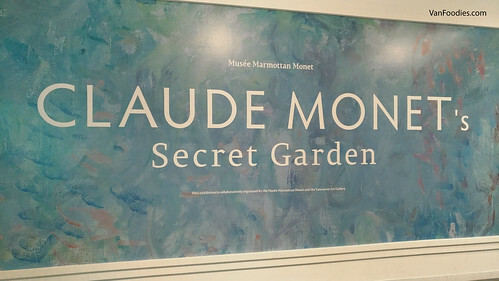 It was the final week of the Claude Monet Secret Garden exhibit at the Vancouver Art Gallery. I had no idea why it took me so long to finally check it out, but I made it! CC and I planned a fancy girls’ day out. 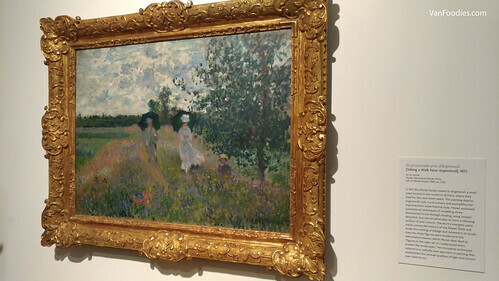 I thoroughly enjoyed the exhibit, witnessing the evolution of Monet’s work. 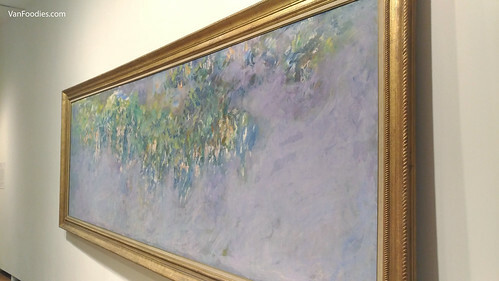 In addition to the Water Lilies, my favourite pieces were Taking a Walk Near Argenteuill, Wisteria, and Weeping Willow. A pleasant surprise was Stephen Shore‘s photo exhibit in conversation with the Monet’s exhibit. 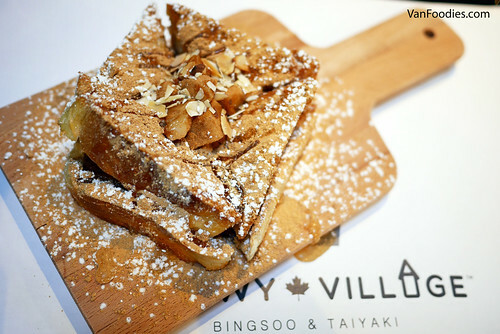 Snowy Village Coquitlam – Everything Mochi! 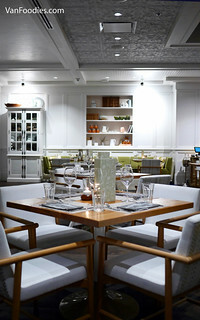 Snowy Village opened its Coquitlam location in late December. The cold winter and rainy spring didn’t seem to stop people from getting their shaved ice/bingsoo fix. Everytime I went (3 times now, in the last 2 months), there was always a short lineup at the door. So we noticed some new items on the menu – Mini Watermelon and Honeydew Bingsoo, Golden Cheese and Injeolmi Toasts, and Cheesy Mochy. Naturally, we gave some of these a try. Cheesy Mochy sounds like a perfect item for the night market (by the way the two night markets are now open) and would make a nice savoury option here. There were 9 pieces of oblong shaped mochi, topped with gochujang sauce, mozzarella and Parmesan sprinkles. As I picked up the mochi ball I got a tiny bit of cheesy pull, but nothing Instagram worthy so to speak. The texture of the mochi ball was harder than I thought; not jaw breaking hard, but dense and chewy much like the ones at Korean restaurants. The mochi balls are stuffed, with what looks like cheese, but there was zero pull and nothing gooey ooey. And no flavour too! The gochujang sauce was good, sweet, slightly spicy, and with mochi balls they have formed a great combo. But, overall it was a bit underwhelming. The Injeolmi Bingsoo is one of my favourite flavours so I was really curious about the Injeolmi Toast. It’s like thick toasts you find at Taiwanese restaurants. It was an almost inch-thick mochi sandwiched between two pieces of bread, toasted. On the rare occasion that CC and I got to hang out we chose to check out CandyTown in Yaletown, and we decided to first grab a bite at Small Victory Bakery. While CC opted for a sandwich, my eyes were set on those fluffy croissants in the showcase. 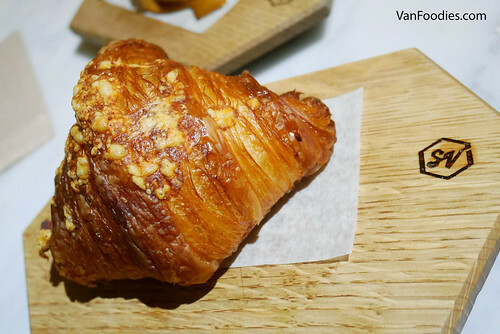 I didn’t simply go for a butter croissant, though; I wanted a Breakfast Croissant. Sadly they sold out of it, so I went for the Bacon & Cheese Croissant instead. It’s light, fluffy, buttery. Then, as I got to the middle, there’s melted cheddar cheese with some meaty bacon. Of course, for the meat lover in me, I wish there’s more bacon. But because the cheddar cheese was also salty, too much bacon would’ve shot the salt level through the roof. This was perfectly balanced, and seriously, I could’ve easily had another one of these.